Though you generally move slowly through a parking lot and assume that others are carefully watching for moving vehicles and pedestrians, untold numbers of accidents occur each year in parking lots. Perhaps because high speeds are not part of the equation, there seems to be a difference in how carefully people drive in parking lots. You have probably seen people talking on their cell phones as soon as they begin to back out, or look over their new purchases or simply begin talking with another person in their car. In any case, distractions, the close proximity of other vehicles and, in some cases, limited visibility frequently add up to an accident. In most cases, parking lots are private property. As such, the laws that apply to moving vehicles on public roads don't always apply. In most cases, since low speeds are involved and few people suffer physical injury, local officials will not apply blame to the incident. In fact, you may even have difficulty getting a policeman to respond to your call so you can document the accident. What to Do If Someone Lies on a Car Accident Report? What Happens When You Rear End Someone? Because most parking lot accidents occur on private property, insurance companies become the final arbiters in deciding who is at fault and who will pay for damage. Under these circumstances you will be responsible for getting the other party's information and testimonies from witnesses. This will be essential should you need to defend your case. Almost without exception, drivers will have very different perspectives of what took place, and under these circumstances the testimony of witnesses will be invaluable -- especially since the word of your passenger(s) will not be taken into account. If you are unable to procure the other party's information, write down as much as you can get on your own (such as license plate numbers and witnesses' accounts). The usual reasons an individual will refuse to give you insurance information are that they don't have insurance or they believe you are at fault for the accident. Their reasoning is that you are at fault and your insurance should pay. Also, they don't want to file against their own insurance, but this thought is misguided. If you fail to file a claim, you might jeopardize your coverage. Attempt to call the police, again if necessary, to have them come to the scene so you can file a report. If they won't come to the scene because it took place on private property, go to the nearest police station and file a report. All this information can assist you when filing with the insurance company and in its determination of who is at fault. Parking lot accidents may be minor and devoid of physical injury or significant damage, but it is still best to contact your insurance company if for no other reason than to alert it. You will be protected should the other party file a claim against you. Accidents that occur in parking lots are notorious for being among the most disputed accidents. For this reason, file a police report even if you have to walk it in. This can protect you should the other person not have insurance or if she attempts to file a personal injury claim after the fact. From the insurance company's point of view, several factors are considered when determining fault of an accident that occurs in a parking lot. Generally, if you are the one backing out of a parking space when the accident occurs, you are the one who will be blamed for the accident because it is your responsibility to yield to oncoming traffic. Where the impact occurs can affect the outcome. If someone backs into you, he will be held responsible for the accident. If you are backing up and are hit by another car the situation is different. Generally the other driver will be responsible in full or part for the accident. Depending upon how close to the front of the car that the damage occurs the more likely the liability for the accident is to be placed on the one driving the car that was not backing out. 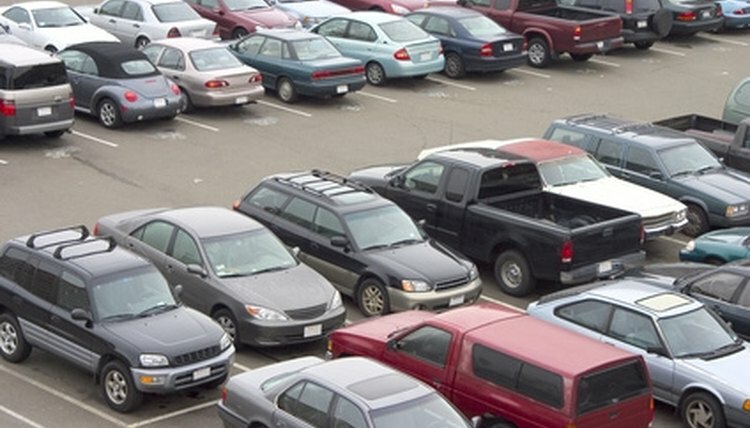 In most cases, liability for an accident in a parking lot is not attributed to just one party. In such situations, both parties will share in liability with varying percentages of fault unless one side can provide significant information, including eyewitness reports. Should you accidentally hit a car that is illegally parked, you will be found at fault and completely liable for damage to both cars. As the one in the moving vehicle, you are expected to be aware of your surroundings. The illegally parked car is not moving, and therefore it is considered part of your surroundings. Maurice Spellbinder is a freelance legal writer. In addition to a background in legal practices, Spellbinder has studied history and government systems. Political opinion is another passion which takes up a great deal of his writing time. He has been writing for more than 25 years. Spellbinder, Maurice. "Parking Lot Accident Law." , https://legalbeagle.com/6536260-parking-lot-accident-law.html. Accessed 20 April 2019.